incidences of usage was virtually non-existent. Income and ethnicity largely explain the discrepancy in enforcement. the equal protection, requires equal enforcement principle of Canadian jurisprudence. Canada’s current system of prosecuting minor cannabis offenses traps too many Canadians in the criminal justice system for non-violent offenses, according to Canada's newly elected Prime Minister, Justin Trudeau. "It is expensive for our criminal justice system, too many Canadians end up with criminal records for possessing small amounts of the drug, and the current system does not prevent young people from using it." When it formed the government in 1993, the Liberal Party, despite some rather dramatic electoral defeats, had held power for most of the 20th century, in fact, The Liberal Party is often referred to as the natural party of Canada. The Liberal Party proposed the use of cannabis for medical purposes, and complete decriminalization of the possession of small amounts of it. There are two possible pathways, one legal and the other administrative, and at this juncture of his leadership, Trudeau has concentrated his attention on the former. 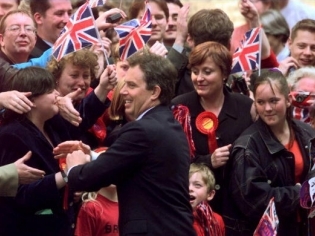 Nearly two decades ago, another young leader of a party that had not been in power for some time, Labour MP Tony Blair, became Prime Minister in a landslide victory over the Tories in the United Kingdom. Blair, like Trudeau, swept into office as the champion of the young, and was more interested in what was just and not just what was legal. Blair had come to realize that to some extent, the laws against marijuana possession, even small amounts, were not being enforced equally, and without equal enforcement, there is no equal protection under law. In fact, there were wide variations in enforcement across the Metropolitan Police Forces in the UK. And, even a cursory review would lead one to the inescapable conclusion that in some communities, recreational use of small amounts of marijuana was for all practical purposes decriminalized. At the same time, there was strict enforcement in other areas of the cities of London, Manchester, Birmingham and Liverpool, and almost no enforcement at all in other areas of those same cities, Islington and Chelsea in London, for example. Income and ethnicity were the obvious differences between the areas of high and little or no enforcement. Whereas it is the duty of the courts to sift out and uncover incidences of prosecutorial bias in law enforcement, Maggie Thatcher had gone too far up the war-on-drugs road with her erstwhile American Tory, Ronnie Reagan, to suddenly let a pain of conscience reverse the trend in drug arrests and prosecutions of which she boasted. During the campaign Tony Blair came to Oxford, where he was asked specifically about the disparities in marijuana enforcement, and he stated in no uncertain terms that he intended to address the problem. After his speech and greet and meet session which followed his visit to his alma mater, several of us decided to form an informal group to observe just how Tony Blair would make progress on this issue, if he won the election. There are few things that are more intriguing to a group of Oxbridge academics than to watch a new prime minister grapple with their attempts to fulfill the wide range of campaign promises they made to gain office, especially an ethical one. This issue would prove particularly perplexing for Tony Blair, as it will for Justin Trudeau. If the phrase, it's always darkest, just before the dawn, was ever applied appropriately, it was an exacting description of the morass from which Tony Blair emerged as he found a way through and to a just end to the widespread marijuana prosecutorial bias injustice. ​Thomas Jefferson wrote that the path to liberty was often strewn with thorns. Blair, like Trudeau will, began by consulting members of his government, who in turn sought the advice of members of the various departments and agencies of government. Trudeau will consult the provinces as well, given the decentralized nature of Canadian government. Remembering that Canada’s constitution is made up of both written elements, that is, British and Canadian statutes as well as court judgments, and as in all conservative democracies - unwritten elements, such as traditions, customs and other conventions and precedents. The result was that the Blair government became bogged down in the weight of laws, international treaties, bilateral as well as multilateral political understandings, protocols and accords, each of which suggested to the Blair government that he could not take unilateral action and achieve his stated goal of stopping the use of minor marijuana violations from creating a permanent underclass in British society, as it had in the US under the banner of being tough on crime. The Blair government, at that time, had grossly underestimated the extent to which Thatcher, the Tories, had involved the British government in the war on drugs spearheaded by conservatives, Tory Republicans, in the United States. A lesson Trudeau will learn concerning the extent to which Harper had involved Canada in the US-led war on crime with its emphasis on drugs, as the high priestess of all criminal activity (Harper's acquiescence to US-like system of minimum sentences and, (Bill C-51) the US Patriot Act which included the requirement for Canadians to have a passport to travel to the USA is the subject of another contribution). ​It will not go unnoticed that in the provinces the jails and courts are replete with minor drug offenses, and at a very high cost to the central government treasury. While Blair was mired in the legal morass, members of Metropolitan Police Forces across the UK and Northern Ireland, and of his own government were continuing to meet with representatives of the war-on-drugs regime from the US. And, while his aides were coming to grips with all the legal ramifications of drug decriminalization, members of his own government were travelling back and forth, to and from the US, increasing the number and extent of bilateral ties between the two governments in the war on drugs. As word of Blair's activities looking into the marijuana injustice reached the hitherto conservative press ... let us say that the conservative press who had championed Thatcher and the war on drugs were, to say the least, unsympathetic. From time to time, when one or another of the informal Oxford group would encounter Blair or one of his aides, we would inquire as to how the campaign was going. The inevitable reply would be that things were progressing. When pressed for details, the frustration of the Blair administration would surface, and the reply would change to something to the effect that it was easy for a group of academics to expect quick results, but those in government know the realities of the situation and that things of this nature have a way of moving slowly. In response, one or the other of us would ask, but why are you pursuing the legal route? This to-and-fro interaction with the Blair administration occupied the first few years of the Blair government, until one day the informal group at Oxford met with a Blair aide who asked the question directly, what in your opinion are we not doing to address this problem? After thanking the aide for the opportunity to offer with the greatest sense of humility our considered opinions, we explained that Blair had more power than any Caesar could have imagined, even at the very height of the Roman Empire's influence. ​The aide thanked us for that comparative insight into the power possessed by Blair vis-à-vis the rulers of the Roman Empire, and then sought to ascertain what exactly we thought that Blair was not doing? Again, we thanked the aide for the opportunity to inform Prime Minister Blair on a question of policy in relation so important an issue, and stated that every aspect of the war on drugs, including the arrest and prosecution for possession of small amounts of marijuana across the United Kingdom and Northern Ireland, was being paid for by his government, therefore, he should simply stop paying for it. A few days later, Prime Minister Tony Blair called a press conference at which he announced that his government would not pay a single penny to any police force in the UK for the arrest and prosecution of individuals for the possession of small amounts of marijuana. In an instant, the whole house of cards that had for years criminalized and jailed youth in some areas of the UK, while others lived in areas where possession of small amounts of cannabis was not policed, vanished, in favour of a system where the possession of small amounts of cannabis was not policed in any area of the United Kingdom. Without equal enforcement, there is no equal protection under law. Job well done, Tony Blair. a book by Eric LaMont Gregory, on sale now, everywhere!